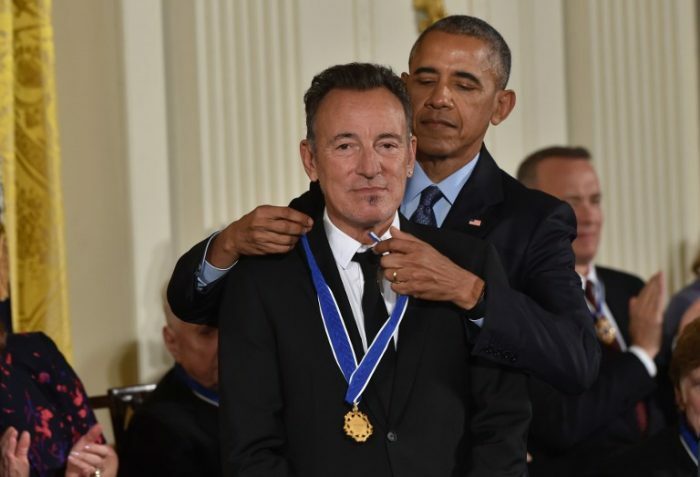 Bruce was awarded the Presidential Medal of Freedom today, our nation's highest civilian honor, recognizing "an especially meritorious contribution to the security or national interests of the United States, world peace, cultural or other significant public or private endeavors." As a songwriter, a humanitarian, America's rock and roll laureate, and New Jersey's greatest ambassador, Bruce Springsteen is, quite simply, The Boss. Through stories about ordinary people, to Vietnam veterans to steel workers, his songs capture the pain and the promise of the American experience. With his legendary E Street Band, Bruce Springsteen leaves everything on stage in epic, live, communal live performances that have rocked audiences for decades. With empathy and honesty, he holds up a mirror to who we are, as Americans chasing our dreams, and as human beings trying to do the right thing. There's a place for everyone in Bruce Springsteen's America.